Forecasters say we’re headed into another unseasonable cold winter. But it’s not here yet, so there is still time to winterize your cool season lawn and prepare to store your mower until spring. Here’s how to give your turf some TLC before it’s exposed to frigid temperatures. 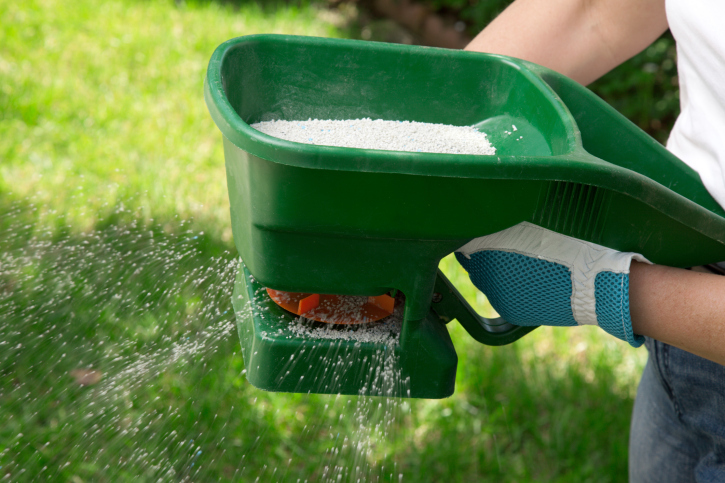 Winter fertilization is an important step in keeping your lawn lush and green. Fertilize. While both warm- and cool-season grasses go dormant this time of year, cool season grasses depend on added nutrients to get them through the winter. This may be the single best thing you do all year for your lawn, so don’t skip this step. Feeding your lawn now will also help to encourage root growth and increase your lawn’s disease resistance. Come spring, the nutrients stored in the roots will be ready to energize new growth. Tip: Choose a winterizing fertilizer, which will be higher in potassium and lower in nitrogen than turf-building varieties. Potassium makes grass more cold- and stress-tolerant. It also helps lawns absorb other nutrients. Aerate. Fall aeration reduces soil compaction and prevents thatch. It enables nutrients and air to more easily reach the roots. This is another way to encourage root growth, and improve stress tolerance. Aerating also gives your lawn a nice top dressing. Do a final cut of the season. Be careful not to damage the turf by cutting it too short or leaving it too long. Experts advise lowering your mower blade to about ½ inch below your standard summer mowing height. If you’ve got a mulching lawn mower, leave the clippings on the lawn. They’ll provide extra nutrients. Rake leaves and debris. Avoid mold by getting rid of larger debris that won’t break down quickly. Leaf piles and large tree limbs laying on your lawn will provide a moist home to disease-causing organisms. If you won’t be using your mower for a couple of months, it’s best to prepare it for hibernation. By following these steps, your mower will be ready to go to work the next time you start it up. Plus, this preventive maintenance will extend its longevity. Remove caked on grass clippings from your mower to prevent moisture build up that can cause rust. Fill the fuel tank and add fuel stabilizer. Then run your mower for a few minutes, in a well-ventilated area, to circulate the mixture. This will keep the gas from deteriorating, and potentially gumming up the fuel system and carburetor. Change the oil. This will further cut down on engine corrosion. Use an old towel to clean caked-on grass clippings from the deck. Those clippings can hold moisture against the metal, leading to rust. Clean and sharpen the blades. Mower blades should be sharpened or replaced annually. Lubricate all exposed metal parts with a rust-inhibitor. This also helps keep the mower clean. Be sure to spray the blade as well. WD-40 works great for this task. Disconnect the spark plug wire and battery. Store the battery in a warm area, and attach it to a charger, to keep it 100 percent full power. Winterizing your lawn and mower now will make caring for both easier next spring. And we’re all about simplifying your outdoor living!